Are you interested in holding barbecue parties? Why not invest in the best horizontal smoker? Most horizontal smokers will either have a plain basic shape or come with an additional offset firebox. If you’re looking for the best horizontal smoker, Char-Griller is proud to present the Pro BBQ Charcoal Grill with Side Fire Box. As the name suggests, it has an extra chamber that is separated from the main chamber. Moreover, it’s connected together to provide maximum heat. Both types will have a chimney of some sort. 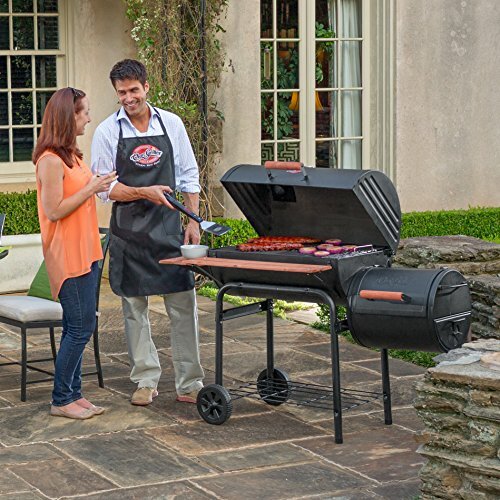 This professional-grade grill from manufacturer Char-Griller offers many enticing features. Read on to discover what this product has to offer! How does a horizontal smoker Work? Imagine a horizontal smoker looks like two barrels joined in a horizontal manner. The meat is placed in the main barrel. The smaller barrel or the ‘off-set’ barrel is where the fire will be coming from. It is referred as a firebox. The cooking chamber with a hinged lid is located in the main barrel. A firebox, on the other hand, is located at one side. This is the small barrel constructed a little lower than the height of the main barrel. A firebox mounted on the side is what horizontal smokers traditionally look like. The charcoal or wood-based fire is constructed in the base of the firebox. The fire does not lie underneath it like on a typical barbecue grill. Instead, you will find it beside the cooking chamber. The smoke and heat will enter the main cooking compartment from the bottom right-hand side and circulate around the meat on the grill. Where does the gas go, you ask? They exit through the chimney on the left. Make sure to rub your chosen meat with the seasoning you prefer. It will be better if you put the meat in the refrigerator for at least an hour. If possible, let it soak overnight. This will allow the seasoning to permeate in the meat. At first, you should use dry charcoal. Make sure to light it and once it turns red, add the wood for more heat and smoke. Control the remote temperature level. It is incredibly important to keep the heat in check. The smoker needs oxygen in order to create heat. The dampers will help regulate this. Make sure the cooking chamber and firebox are closed. This is for efficiency purposes. The duration of smoking or cooking meat depends on the type of meat and its thickness. Keep an eye on it to ensure that you achieve the proper level of doneness. 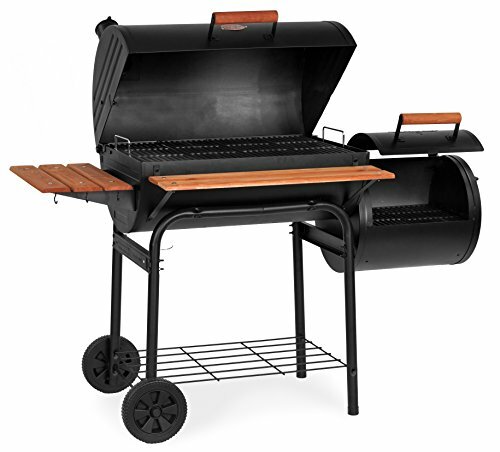 Let’s further review the features of the Char-Griller Pro BBQ Charcoal Grill with Side Fire Box so that you can understand why it is the best horizontal smoker in the market. The cooking grates are crafted using non-stick iron. It’s constructed that way to prevent warping and to maintain even heating. 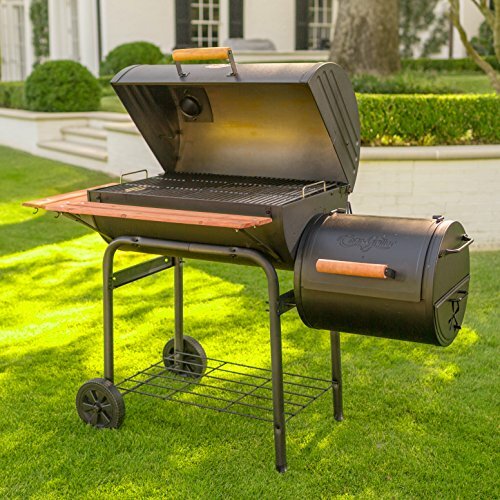 The grill barrel has been crafted with heavy-gauge powder-coated steel. This powder coat finish will enable the color to last long. Moreover, the cooking space or area has a total size of 830 sq. in. so that you can cook a greater amount of food on it. This smoker has a built-in thermometer so there’s no need to buy one. It’s useful to monitor the temperature and ensure that it is steady the entire time. The provision also means that you don’t need to regularly open the smoker. Aside from ensuring optimal cooking, you can avoid smelling the smoke. 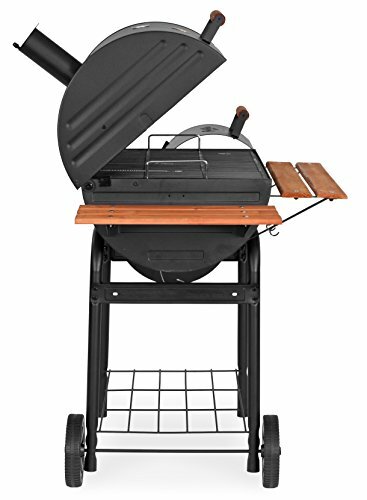 The Char-Griller Pro BBQ Charcoal Grill with Side Fire Box is built with a 250 sq. in. fire box on its side. This is designed to produce the best Texas-style barbeque you can ask for. The side firebox can be used for charcoal smoking or cooking. The heat can be manipulated with dampers that can be adjusted to your preference. The heat gauge and fire grate will help you keep track of the temperature. There is even an ash pan for easy cleanup after cooking. The ash pan is also adjustable for a straightforward maintenance process. Furthermore, place the wood and charcoal in the firebox. The smoke is directed around and over the food in the main chamber. Almost all smokers with offset firebox also work as grills. The charcoal drawers on this smoker are detachable. This will allow the users to easily add charcoal and dump ashes when necessary. With this feature, lifting or sliding the grates while cooking is no longer necessary. This can make the cooking process speedy and hassle-free. Hence, why it's considered the best horizontal smoker. Still unconvinced? Let the following convince you that this is indeed the best horizontal smoker. Dimensions: 62 x 29 x 50 in. Cooking surface: 580 sq. in. Here are the advantages that this smoker has over other similar products. Though this is the best horizontal smoker, it is inevitable that it also has some disadvantages. Below are two drawbacks of this product. At this point, you should be able to see why many backyard grilling enthusiasts and professional cooks prefer this product(and others). It is considered the most versatile and the best horizontal smoker in the market at the moment so look no further for the perfect addition to your backyard.